Since I arrived home on Sunday evening I have had four meals containing leaves harvested from this box and there are plenty more to come. 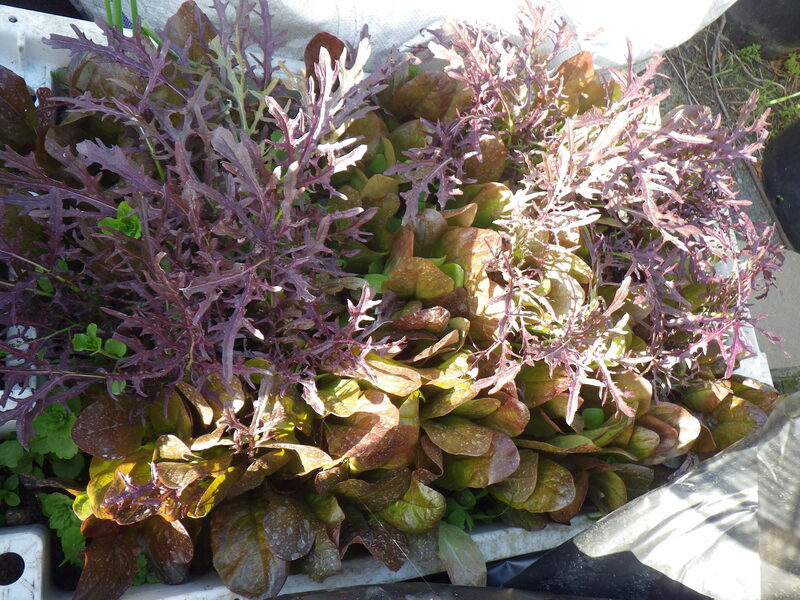 I chose to plant red mizuna and a red-leaved lettuce, plus there are a few self-seeded Claytonia in there. I can harvest exactly the amount I want, so my salads are always fresh. If you want to start growing and only have a limited space, or worry that your skills are not up to it, get yourself a container and plant some seeds for salad leaves (you can buy a mixed packet). Choose cut-and-come-again varieties and you will have weeks of fresh food at a fraction of the cost of those plastic bags of mixed leaves you can buy in the supermarket. Plus the only packaging will be a seed packet or two and you won’t have unused food going to waste in your refrigerator. This is why I garden – pesticide-free food, freshly harvested, no plastic bags, cheap and easy. Welcome back traveller. I hope you both had a wonderful time and the terrible weather while you’ve been away hasn’t held up the building too much. I think if I could only grow one thing, it would be tomatoes. I eat so many of them, and the clever plants just keep on producing. Of course, then I’d try and sneak some basil and maybe oregano, and how about…. Well, you get the idea. Why fight it…? I know it’s hopeless to expect me not to grow stuff! I just can’t help myself! I love being able to pick fresh leaves and they can be fitted into even the smallest space in a container, as you have demonstrated. Tomatoes are just too big for lots of folks unless you get one of the trailing varieties to grow in a hanging basket. “One yarned up hippy babe.” Wow, now that is a cool description! And I love your lettuces. Mine are being eaten by a very greedy rabbit who deserves to go into Mr. MacGregor’s pot (minus the little blue jacket, of course). Happy (human) munching! I think I may have to add that description to my ‘about’ page! Great reminder – I’m gonna sow me some today! Great tips! And you can do herbs, too!